AACC students said Crocs are out for 2018, but jogger pants are a returning trend. 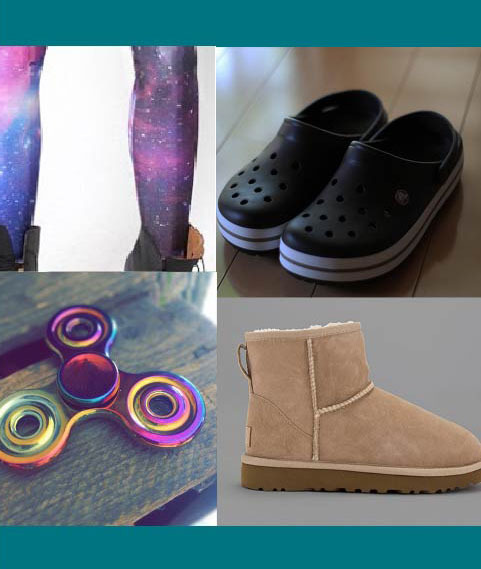 In an informal survey of Campus Current editors and Winter Session students in January, nine out of 22 said the colorful, comfortable clogs are out. So are: overly arched eyebrows, extreme contouring, gauge piercings, velvet, Millennial pink and fanny packs. What’s in? VSCO, Vine 2, crop tops, galaxy prints, the color lavender and #metoo. “I want UGGs to be cool for guys to wear,” said Jump Start student Aidan Siegel. “I want black to continue to be fashionable for the women in charge of #metoo,” first-year history major Kimberly Mae said. According to the online pop-culture blog PopSugar, upcoming movies like “Oceans 8” and “A Wrinkle in Time,” with dominating female roles, will be trendy in 2018.